This two-player card game recreates the drama of the day Allied soldiers went ashore in occupied France, 6 June 1944. 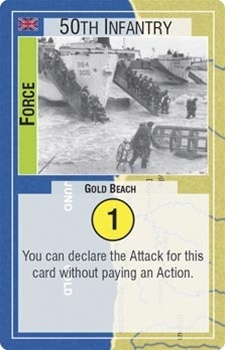 Each of the historic landing beaches - Gold, Juno, Sword, Omaha and Utah - is represented by its own card, as are the defending German divisions and attacking Allied units. 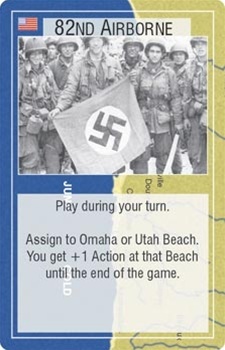 The Allied player must marshal his resources to gain and secure control of every beach by day's end: one run-through of the beautifully illustrated 110-card deck. The tension in the game increases with each card thrown, like the build up in a close baseball game. 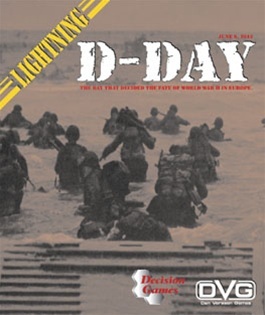 At first it seems the Allies have resources to meet every crisis across the beachheads, but if a key airborne division gets scattered across the countryside, allowing a counterattacking panzer division to slip through the perimeter, everything can change instantly. And an Allied unit committed to one beach, where you might find the defense isn't as strong as you thought, can't be called back in time to rush to the true danger zone. Both players must constantly be thinking ahead, looking for ways to best utilize their cards several throws down the line.